Awareness of veganism is soaring and vegan-friendly products have never been more readily available. You may be surprised to discover just how easy doing your weekly shop in a supermarket can be. Many well-known supermarket staples are registered with the Vegan Society Trademark, allowing you to buy with confidence. You have probably already spotted the sunflower symbol on products in lots of different stores, this is a sign that we’ve worked with the company in question to ensure that no ingredients in that particular product are derived from animals or tested on animals on behalf of the manufacturer. If you are looking for some inspiration, take a look at this list of some common Vegan Society Trademarked products that can be found in most UK supermarkets. Not all vegan-friendly products will carry the Vegan Society Trademark, so it’s important to be savvy and know what to look for. Here are some simple tips to help you tackle your weekly shop. It’s no surprise that vegans tend to be very familiar with th e fruit and vegetable aisle! Other staples like grains, nuts, beans and pulses will likely take up much of the shopping trolley. Unprocessed foods like these are often the easiest to determine as vegan, but watch out for things like waxed fruits which may be coated in insect-derived materials in order to preserve their freshness. Large supermarket chains will stock plant-based milk alternatives, with most stocking a variety of soya, oat, rice, almond and other nut milk alternatives. It’s also quite common for supermarkets to sell own-brand versions of these products, which can often be a more affordable option. However, these can sometimes contain animal-derived D vitamins, so always check the label. Most UK supermarkets are increasing their efforts to ensure that their vegan-friendly products are labelled accordingly. One example of this is Asda, who have been working particularly closely with our team to register more of their own-brand products with the Vegan Society Trademark, including seasonal products like Easter eggs and even mince pies! Other supermarkets are beginning to label their own brand products as vegan, which is always encouraging to see. However, it is important to note that these labels are often self-certified and The Vegan Society can only verify that a product is suitable for vegans if it carries the Vegan Society Trademark. Many supermarkets are still lagging behind when it comes to vegan labelling, which can make things a little more complicated. Take a look at this blog for some guidance on what to look for in ingredient lists. If you have a wander around the fridge aisles of large supermarkets, you will usually find a meat-free section that will stock items like falafels, vegan sausages, vegan soups and ready meals for when you fancy something quick and easy. Just double check that they don’t contain other animal-derived ingredients like milk, eggs or honey, as they will usually be next to vegetarian products. There is also a growing selection of vegan-friendly foods in the freezers of supermarkets, with things like soya mince, vegan sausages, vegan burgers and other vegan-friendly meat alternatives readily available in most places. Again, you will usually find these in an isolated section of the aisle, along with the vegetarian products. The Free From aisle in most supermarkets can often be a cornucopia of vegan-friendly goods, making life a lot easier. Things like ready-made pasta sauces and dairy free pesto will often be found here, as well condiments like vegan mayonnaise and salad cream. The good news (or maybe bad news, depending on how you look at it!) is that there is no shortage of vegan-friendly treats in UK supermarkets. There are a lot of mainstream, unlabeled products like crisps and biscuits that are ‘accidently vegan’ – a simple Google search for this term will bring up tons of suggestions. You can often find things like vegan-friendly chocolate, biscuits and other sweet treats in the Free From aisle too. Most of the big supermarkets will even offer vegan cheeses, although it is likely to be a case of trial and error until you find one that suits your palate. Supermarkets are quickly cottoning on to the rapid growth of veganism and are learning how to better cater for vegan customers. Some of the major supermarkets have created lists of products that are safe for vegans, where you can find hidden gems like which products from the in-store bakery are vegan-friendly. These lists can become outdated quite quickly and recipes may change, so it is always best to double check that you have the latest version by contacting the supermarket directly. Some stores won’t have any kind of vegan list available, but they should know if the products they manufacture contain any animal derived ingredients. The most reliable option in this case is to contact the supermarket directly and ask them about the product in question. You can then suggest they register for The Vegan Trademark to provide their consumers with reassurance and clarity. Some popular products that carry the Vegan Society Trademark and can be found in supermar kets. Alpro – Alpro make a range of plant milks, yoghurts and desserts (including custard!) that are registered with our Vegan Trademark. A selection of Alpro products can be found in most major supermarkets. Booja Booja – Booja Booja are makers of premium vegan ice-cream and chocolates, their products can usually be found in Waitrose and on Ocado. Follow Your Heart – Follow Your Heart are best known for creating an exciting range of vegan alternatives to dairy and egg products, including Vegenaise and VeganEgg. Find Follow Your Heart products on Ocado. Fry’s Family Foods – Fry’s Family Foods are a South African company that have a wide range of vegan meat alternatives, including everything from pies to stir-fry strips. You can find a large selection of their products on Ocado and now in Sainsbury's. Gosh! – Gosh! are creators of plant-based sausages, bakes and burgers in a range of temptin g flavours. They can be found in Tesco, Morrisons and Sainsbury’s. HECK – HECK food have recently branched out into the vegan market. Their Bollywood Bites and Super Green Balls are both registered with our Vegan Trademark and can be found in Waitrose. Koko – Koko make a coconut based alternatives to dairy products, including vegan yoghurts and flavoured milks. You will be able to find Koko products in Asda, Tesco, Morrisons, Sainsbury’s and Waitrose. Pure Free From - Pure Free From make a range of delicious vegan spreads that are also gluten free. Find it in Tesco's, Sainsburys or on Ocado. Quorn – Quorn produce a range of vegan products which are registered with our Vegan Trademark, including vegan fishless fingers and vegan hot and spicy burgers. Most major supermarkets will stock a selection from the range. Rebel Kitchen – Rebel Kitchen’s ‘Mylks’ come in a variety of flavours including chocolate, banana and coffee. They can be found in Sainsbury’s, Waitrose and on Ocado. Sacla – Sacla are well known for their widely available vegan pesto, which can be great to have when you are in need of a quick and easy meal. Sacla has also released a Vegan Society Trademark registered vegan mayonnaise, which can be found in Sainsbury’s and on Ocado. Strong Roots – Strong Roots make a range of healthy freezer items, including vegetable fries and spinach bites. The full Strong Roots range can be found on Ocado and in Tesco and Sainsbury's. The Tofoo Co. – The Tofoo Co. brand of tofu can be found in most major supermarkets. This extra firm tofu comes in a variety of flavours and doesn’t need to be pressed, which makes it handy to pick up for a quick meal. Tofurky – Tofurky is probably best known for making a range of meat alternatives. Currently, most of their range can be found on Ocado, but they also make a range of pre-packaged sandwiches that can be found in Whole Foods. Their deli slices and sausages can also be found in Sainsbury's. VBites – VBites products can be found in Morrisons, Waitrose and on Ocado. VBites make a very large range of meat alternatives, including meatballs, fish-style steaks, bacon-style rashers and deli slices which are perfect for sandwiches. Vitalite – Vitalite Dairy Free Spread is found in most supermarkets. It acts as a great replacement for butter in baking, cooking or just simply spread on toast! We should also mention. 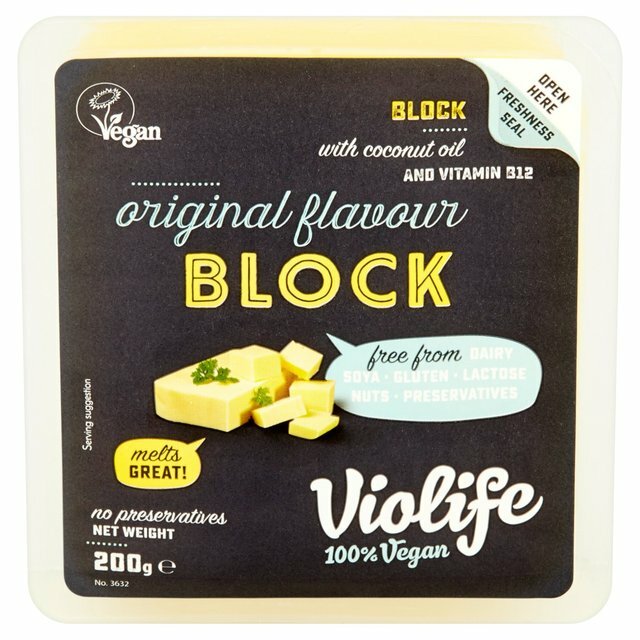 Violife – Violife comes in a variety of styles and tends to be milder than a lot of vegan cheeses, which makes it popular among new vegans. You can usually find Violife original slices in larger stores of the most popular supermarket chains. Search for more vegan-friendly products using our trademark search.